Maurizio Sarri challenged Gonzalo Higuain to improve physically and mentally after the striker fired another blank in Chelsea's 2-0 defeat at Everton. The 31-year-old battled illness in the lead-up to Sunday's trip to Goodison Park and made way for Olivier Giroud after an ineffectual 66 minutes. 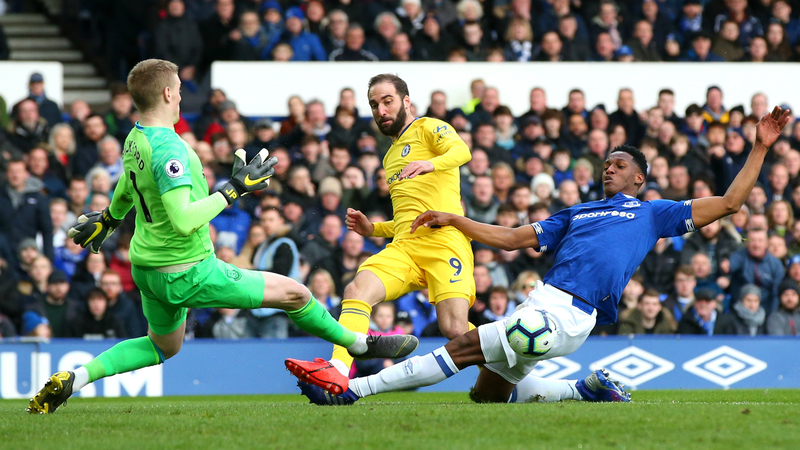 His fluffed close-range finish early in proceedings typified Chelsea's wasteful start and the visitors paid the price through second-half goals from Richarlison and Gylfi Sigurdsson. Higuain, who joined on loan in January, has now scored just once since a double against Huddersfield Town on February 2, raising questions over his long-term future in London. "In this moment, yes of course [he is struggling to score]," Sarri said. "Today he had an opportunity. Too few for him I think. He can do more. "He was improving, but then he had some problems at the beginning of the week. He had a strong stomach fever so today it was normal that he could only play for 60 or 65 minutes. "He needs to improve his physical condition and mental condition." Chelsea's first defeat since the EFL Cup final came as the result of a listless second half and left them three points adrift of the Premier League's top four. Sarri's men are through to the Europa League quarter-finals and can use that competition as a route to Champions League qualification, but the Blues boss is not giving up hope of catching Arsenal. "It is not impossible. Why impossible? We need to recover only three points I think so it is not impossible in eight matches," the Italian said. "It is impossible if we cannot improve and not able to avoid a second half like today. "We need only to play like the first half for eight matches, without stopping playing and stopping to defend. This is the limit."